​Join us for our second annual Creative Expressions event held in Bruno, Saskatchewan. The event is a way to share what artistic talents people have through crafts, their voices, dance, writing and more. The event holds entertainment such as readings from some great authors, vocalists, crafts, local vendors and so much more. A family-friendly event that has some activities for the children, great food provided by Christy's Casseroles, and a large variety of handmade and artistic works for the young and old, no matter what gender you are. 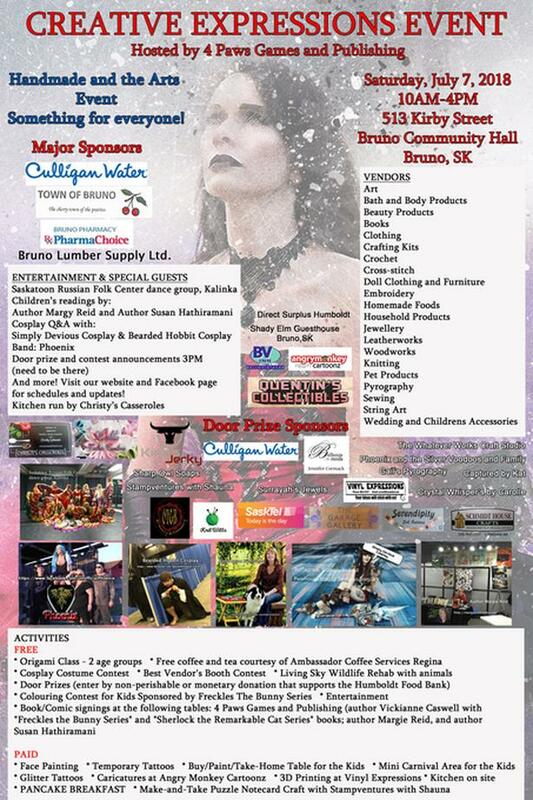 Some of this year's additions include, different vendors, cosplay/costume contest, door prizes (entries by non-perishable or monetary donation - must be there at 3PM to win) in support of the Humboldt Food Bank, a children's area with free and paid activities, Living Sky Wildlife Rehabilitation, 2 age group origami classes, and more! Come volunteer as entertainment or help for the day, vend with us or simply come out and see what it's about! Hosted by 4 Paws Games and Publishing.